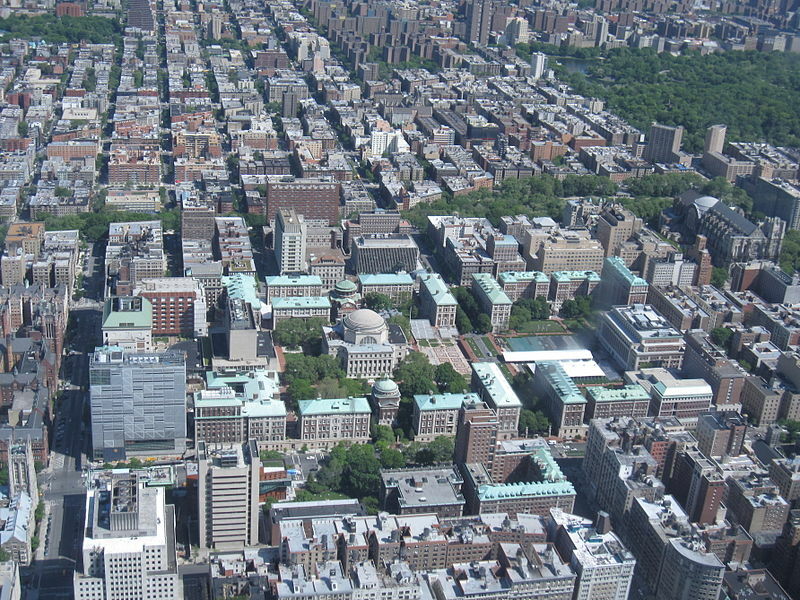 Astrogeographic position of the whole of the Morningside Heights Campus for morphogenetic field level 3 which describes its atmosphere and energetical topics : one coordinate lies in emotional water sign Cancer the sign of the moon, motherhood, feeling at home, the uterus, emotional indivduality and self-centeredness, melody and melancholy. In regard to science Cancer relates to an emotional approach to logical thinking which moves step by step and with a tendency of an intuitively mathematical conclusion. The opinion that Cancer is not capable of thinking or of logic as such is actually a mistake. Cancer may be thought to m ove forward slowly – but in fact when it has taken a step the knowledge gathered can be highly convincing for further conclusions as long as they move in the same direction. i have often felt highly impressed by the exactitude of results in Cancerian thinking and intuition. If we consider the strong emotion Cancer has for any musical note we can understand in which way a single note (or thought) can include a whole field of a particular emotional topic. To me Cancer is the sign of melody in such a way that it relates to the conent describes by melodies. Cancer may not need to follow the structure of the melody of a song because it feels where the logic of the emotions pattern moves. That particular element makes Cancer less compatible for gossip or mere dry intellectualism. But at the deeper end of mathematics as well as of semantics where numbers or letters have meaning Cancer can deal with that aspect without confusing the different layers of significance. Saying that as the sign of motherhood Cancer could formally be represented by the Alma Mater sculpture in front of Low Memorial Library may be found to feel a bit too short and too simple, but astrogeographically speaking the statue directly incarnates the local field goddes of the morphogenetic field around the Morningside Heights Campus. The 2nd coordinate lies in highly imaginative, relaxed Pisces sign of the spoiritual plane, dreaming, getting absorbed in the imagination of a particular topic. 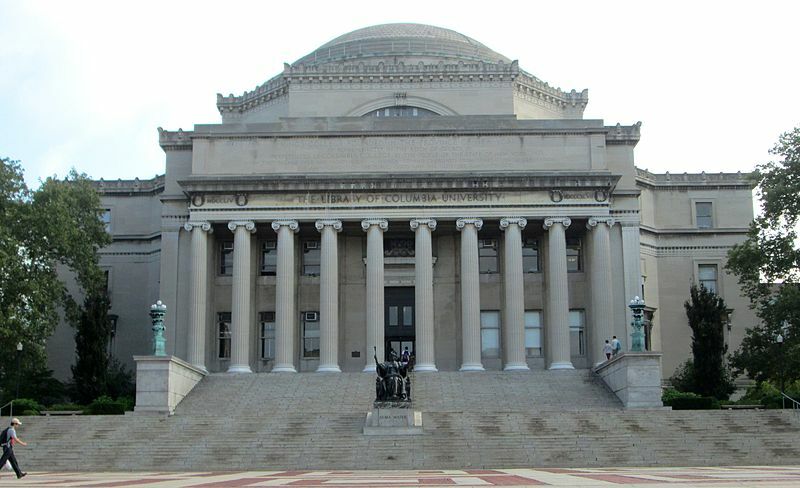 Low Memorial Library was built in 1895 as the university`s central library as a neoclassical allusion to the 2nd century Pantheon building in Rome which is located in Cancer with Sagittarius. Astrogeographic position of Low Memorial Library for morphogenetic field level 4 which describes the atmosphere and energetical topics of the building itself: one cooridnate is in solid, conservative, exclusive, hierarchical, strict earth sign Capricorn the sign of control, government institutions, the ruling classes and patriarchs of society. Capricorn stands for the aims of efficiency, calculability, authority, relaiability, competence and expertise. The 2nd coordinate lies in creative, innovative air sign Aquarius the sign of the sky, heaven, paradise, abstraction, self-finding, inventions and the topic of reconnection with the fuller potentials of human ressources. 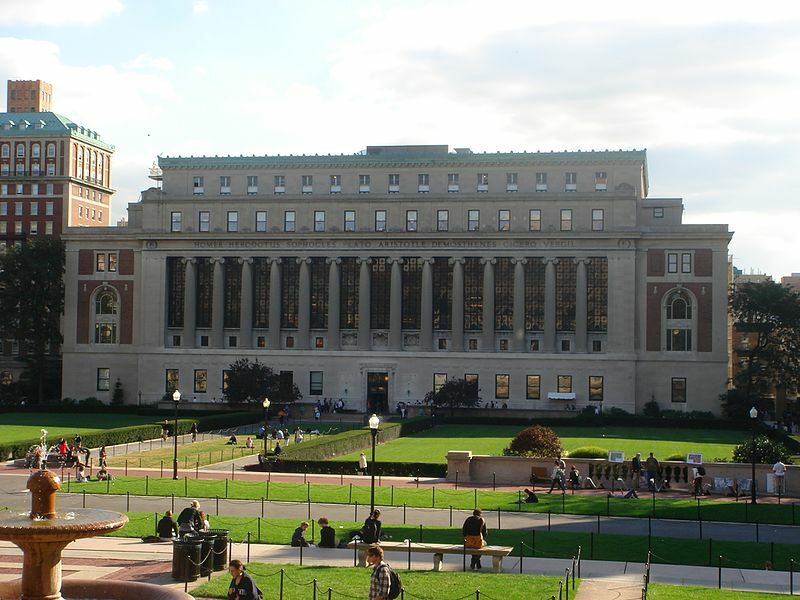 Butler Library is one of the two classicist library temples in the central axis of Morningside Heights Campus of Columbia University, New York. The other one being the older Low Memorial Library. Astrogeographic position of Butler Library for morphogenetic field level 4 which describes the atmosphere and energetical topics of the building itself: the center of Butler Library is located right on the cardinal divide of the winter solstice and the astrological simile of midheaven at 0° in solid, conservative, strict earth sign Capricorn the sign of control, rules and regulations and of a checkpost between the world of wishful thinking and of abstract reality. The rsonance of this position makes Butler Library in some way seem like the energetical center of the exams commission. The coordinate of the astrogeographical latitude lies in earth sign Taurus sign of the earth, grounding, gravitation, growing roots making it in some way the market place of the whole campus.